Miniature waffles, topped with crispy chicken bites, and a sweet ‘n’ tangy syrup are the perfect finger food for any occasion! Today is an extra special post, as it is part of a SURPRISE virtual baby shower, hosted by Terri of Love and Confections, for a fellow food blogger, Angie of Big Bear’s Wife, who just welcomed her bouncing bundle of baby boy to the world! 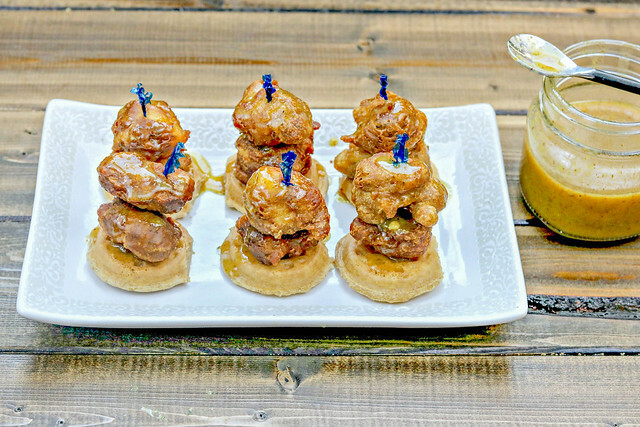 Angie is a lover of all things Disney, and all things southern food, so what could be a better baby shower food than mini chicken and waffles?!? As a fairly new mom and food blogger, myself, I am so excited for the journey that Angie is about to embark on. It’s no easy feat, but it is worth every sleepless night, every shower missed, every meal ordered out, every time you look at that little being that you created. Congratulations, Angie & Big Bear! Should I be embarrassed to say that I had never previously had chicken and waffles? I know it’s served at places around here, and I’ve even been to a Waffle House a time or two. But I’ve never tried it. Which I’ve learned now, is such a shame! Because holy yum! I mean, meat and carbs with a sweet and spicy syrup – how could anyone not love that?? Tell me how?!?! I have been coveting a mini waffle maker for awhile now, to make waffle-y things for the baby, but…apparently they are next to impossible to find anymore. I mean, they have commercial ones that’ll run a couple hundred dollars, but…No. That’s not happening. And when I say mini, I don’t mean just small. I mean the little tiny waffles that are about 2 inches in diameter. Because…adorable. And perfect for appetizers like this, or making a whole array of finger foods for my little. So, because the mini waffle maker is being an elusive beast, I opted to go ahead with the recipe and use organic frozen (apple cinnamon) waffles, instead. And I have no regrets. If you are one of the lucky ones who nabbed a mini waffle maker before they all became unavailable, then definitely make your own little minis. But, if you don’t have one or don’t care to mess with it, let me just tell you that the frozen variety work juuuust perfectly. And the little has been enjoying the extras for breakfast this week. And that chicken. Ohmygoodness, that double crisped chicken. I think a key factor in the whole chicken-and-waffles combo – besides the syrup, of course – is that the chicken be crisp on the outside. You know…texture variety and all. Then there is the syrup. Honey, maple syrup, Dion mustard, and – if you like a little spice – a dash of hot sauce. And we all know I love some spice. You can choose any flavor of waffle…buttermilk, whole wheat, apple cinnamon…but I thought the apple cinnamon worked really well with the flavor profile of this dish. I think J was more interested in dipping the chicken bites into the syrup than anything. That just meant more of the waffles for Nat, and there were no complaints from my little carb-loving girl. I, however, enjoyed them in their entirety. Each perfect bite of waffle, chicken, and delectable syrup. Annnnd, now I want more of them. Anyone wanna deliver to me at work? No? Ok. 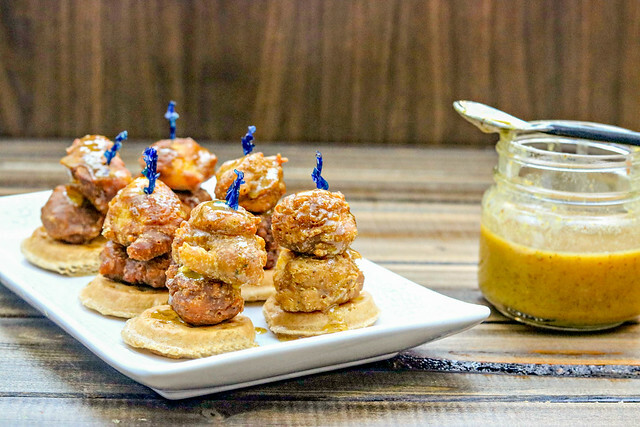 But at least make these mini chicken & waffles for yourself. Check out the links below for more delicious eats in honor of Angie! 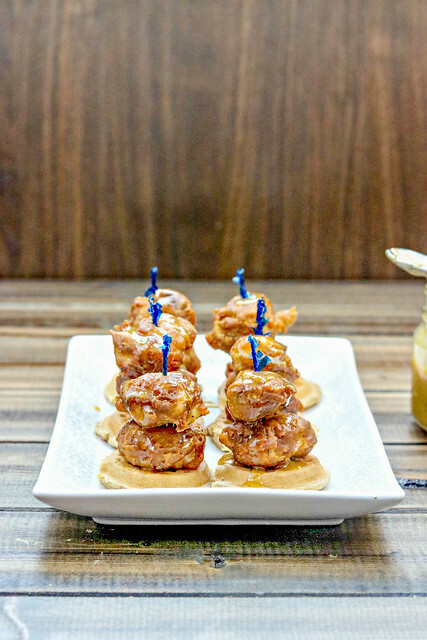 Miniature waffles, topped with crispy chicken bites, and a sweet 'n' tangy syrup are the perfect finger food for any occasion! Combine cornstarch, flour, baking soda, salt, and pepper in a large bowl. Add egg and water and stir to combine. If the batter seems to thick, add more water, a few tablespoons at a time. You don't want it to be runny, but you want it to be thin enough to easily coat the chicken pieces. Add chicken pieces and stir to coat. Now pour about 1 inch of oil into the bottom of a large skillet and heat over medium high, until it is very hot. (Ideally you want it to reach about 400 degrees F.) Reduce the heat slightly just before adding the chicken pieces, so you don't burn them. Meanwhile, combine the honey, Dijon mustard, maple syrup, and white wine vinegar to a small mixing bowl. Stir until combined. Add hot sauce, if desired, and season with salt and pepper, to taste, and set aside. Once the oil is nice and hot, add half of the chicken pieces in a single layer, not touching each other, and fry for 2-3 minutes per side, until nice and browned. Remove chicken pieces to a paper towel-lined plate. Repeat with the remaining chicken pieces. Return half of the chicken pieces to the skillet a second time for about 2 minutes per side, until crispy and golden. Remove to a paper towel lined plate to drain, again and repeat with the remaining chicken pieces. While the chicken is draining and cooling off some, toast your mini waffles in a toaster until golden, crisp, and warm. To assemble place your separated mini waffles on a plate, top with 1-2 pieces of chicken, and drizzle with the syrup. Place a toothpick through the chicken and waffle told hold them together, if desired. 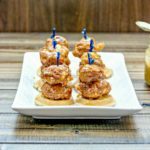 I’ve never had chicken and waffles, either, but your minis look like a wonderful way to try them out!!! Haha – I know, right?!? If you find one (that isn’t $200) you’ll have to let me know!! Above is a link to one available online for $18.00. from Urban Outfitters. Yes, the link is long but I promise it is a good link. It makes the 2″ mini waffles you are talking about. Good luck. Oh, if you google “mini waffle maker” you will find several links under $25.00. Oh my goodness, how perfect!! I wish this shower was real instead of virtual so I could have one! These are so perfect!!!! 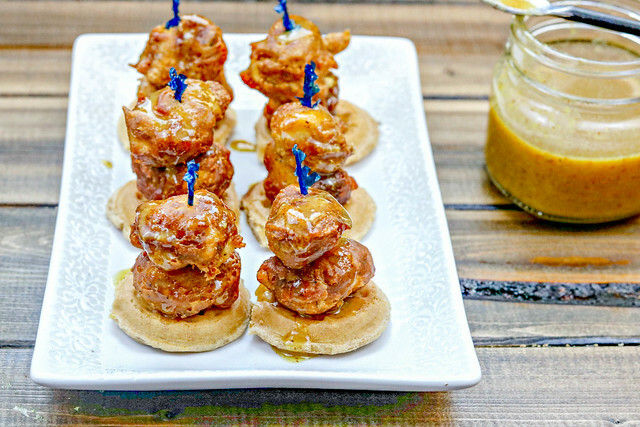 We love chicken and waffles and these mini ones are the perfect size for me!! Oh my gosh, I so totally want to eat these right now! And who would have ever thought to check Urban Outfitters for a mini waffle maker?? ?